Lynchburg, Va. - The Lynchburg Hillcats, A-Adv. affiliate of the Cleveland Indians, have announced their 2019 Carolina League schedule, which begins on Thursday, April 4 in Myrtle Beach, A-Adv. affiliate of the Chicago Cubs, for a four-game series against the Pelicans. Lynchburg's home opener is slated for Monday, April 8 against Route 460 rival, the Salem Red Sox, A-Adv. affiliate of the Boston Red Sox. The 140-game 2019 schedule consists of 70 home games at City Stadium, 39 of which are weekend games on Friday, Saturday or Sunday. Lynchburg will host their popular Independence Day celebration at City Stadium on Thursday, July 4, hosting the Pelicans in the opener of a three-game series. 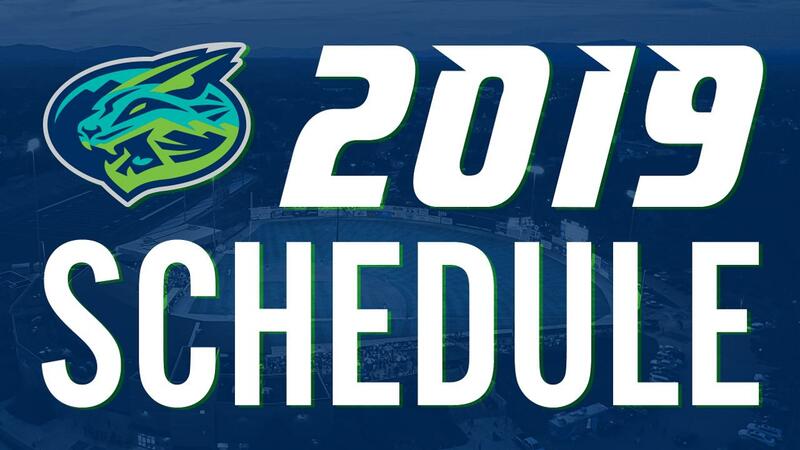 Other key home dates include Mother's Day on Sunday, May 12 against Salem, and Father's Day on Sunday, June 16 in the first half finale against the Wilmington Blue Rocks, A-Adv. affiliate of the Kansas City Royals. The Hillcats are also home for Memorial Day on Monday, May 27 versus the inaugural Fayetteville Woodpeckers, A-Adv. affiliate of the Houston Astros, as well as Labor Day on Monday, September 2 against the Winston-Salem Dash, A-Adv. affiliate of the Chicago White Sox, which also marks the final game of the regular season. 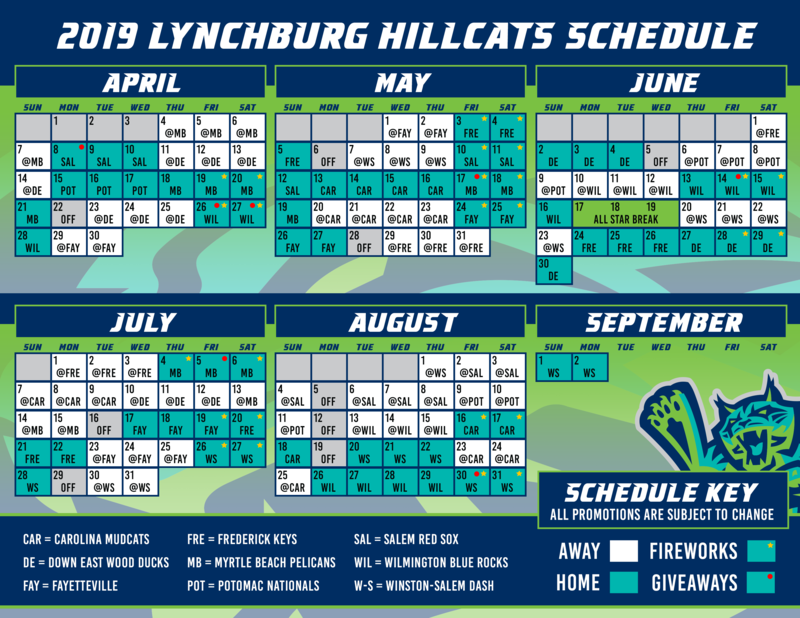 By month, the Hillcats will play 13 home games in April, 17 in May, 14 in June, 12 in July, 12 in August and two in September. Different from previous seasons, the Carolina League now features a rebalanced schedule, allowing all clubs the opportunity to play more non-division games. Overall, 85 of the Hillcats 140 games come against South Division competition in 2019, compared to just 53 in 2018. Each Southern Division team will visit City Stadium at least six times, with Myrtle Beach and Winston-Salem both traveling to City Stadium 10 times. Lynchburg will play host to North Division foe Wilmington a season-high 11 times in 2019. On the road, the Hillcats' most frequent stops will be the Carolina Mudcats, A-Adv. affiliate of the Milwaukee Brewers, Down East Wood Ducks, A-Adv. affiliate of the Texas Rangers, and Winston-Salem, where they will match up with each team 10 times. New in 2019, both Friday and Saturday home games will feature post-game Fireworks. A full calendar of exciting promotions, theme nights and giveaways for the 2019 season will be announced at a later date. All game times are also to-be-determined.